Is the way to a man's heart really through his stomach? I'm not sure about men but I do know food is one way to my heart and soul. 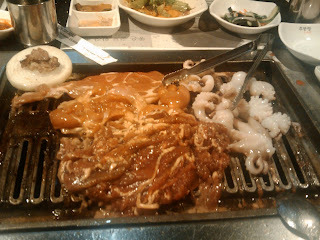 And all-you-can-eat Korean BBQ at Road to Seoul is a new road to my soul. I'm very lucky to live so close to Koreatown in LA. I find so many new Korean restaurants I want to try that my "To Eat" list is always growing faster than I can eat or should eat. Luckily, I have friends and colleagues who indulge me; I formed a "Eat Drink & Be Merry" group at work and the names speaks for itself and below are pics from our recent outing. 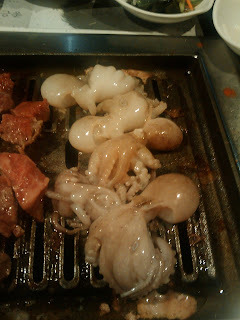 Except for the baby octopus, everything above were crowd favorites. 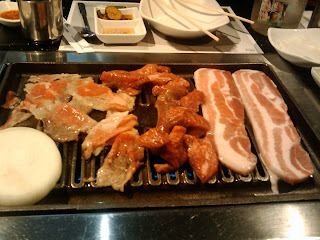 It's definitely better to go to Korean BBQ in a large group in order to try more meats. At Road to Seoul, the AYCE is $16.99 per person and that gives you nine meat choices to choose from and an order of steamed egg, Korean pancake and tofu soup is split amongst 3 to 4 people. In my experience, sometimes in a large group, it gets a little chaotic and the waitress will forget the soup or the steamed egg so remind them if they forget because that steamed egg is delicious. Of course, you will get banchan (a decent selection), rice wrappers for the meat and a huge bowl of salad with vinaigrette to go with your meat. 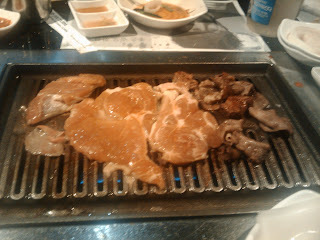 Last tip - In addition to the bean paste and hot sauce, you get a small plate of salt to dip your meat. If you like sesame oil, you can ask the waitress to add sesame oil to your plate of salt for a richer and more fragrant dip. *Takes reservations, good for groups big or small, pretty comfy, spacious seating, big-screen TVs usually showing sports and the mandatory blaring of English pop music. Dodger Dog, Garlic Fries and Beer! Simple but Delicious Meal in 5 Minutes!